The global mattress market is led by players such as SealyCorporation, SimmonsBeddingCompanyLLC, Serta,Inc. These players accounted for an approximate share of 54% collectively, in 2015, as per Transparency Market Research (TMR). These companies are focusing on improving product quality and in order to achieve this they are engaging in partnership agreements. The global mattress market was valued at US$24.70 bn in 2015 and is predicted to touch US$43.43 bn by 2024. The market is predicted to rise at a 6.50% CAGR from 2016 to 2024. On the basis of type, the segment of innerspring mattress led the market in 2015, in terms of revenue and represented 79.9% share in the market. This segment is predicted to maintain its dominance all through the forecast period owing to the growing occurrence of numerous health concerns due to uncomfortable sleeping surfaces and sleeping disorders. In addition, the increasing base of affluent individuals in emerging nations will also raise the demand for high-end mattresses, having innerspring technology. On the other hand, the segment of latex mattress is predicted to rise at the most exponential CAGR between 2016 and 2024. On the basis of size of mattress, the queen size mattress segment held a significant share of 33.1% in 2015, while the segment of double or full sized mattresses held a share of 21.6% in the same year and is poised to experience a moderate rise by 2024 due to the cost-effective and space-friendly nature of queen-size mattresses. 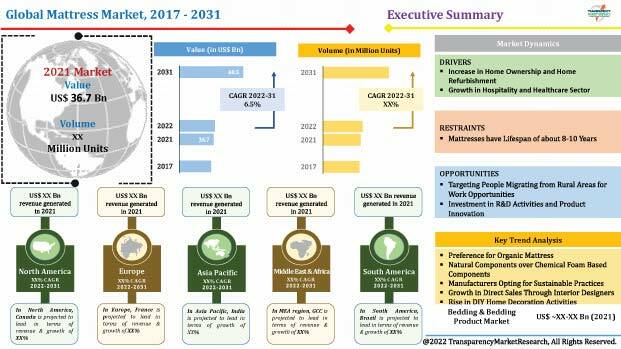 On the other hand, the twin XL mattresses segment is poised to rise at the most exponential 8.20% CAGR between 2016 and 2024 and its share will touch 5.8% by 2024 from 5.1% in 2015. In terms of region, the Asia Pacific mattress market is at present the market leader on the basis of revenue and is predicted to hold lucrative opportunities in the coming years. This region has experienced a huge rise in the activities of construction in domestic and commercial sectors due to the strengthening of economies a few years ago. In addition, the booming industry for hospitality and the growing urbanization have also resulted in an increased inclination toward high-end mattresses in luxury hotels and affluent households. On the other hand, other developing regions such as the Middle East and Africa and Latin America are also predicted to experience a strong growth in the coming years. The increasing activities of construction in commercial and residential sectors and the shifting trends of consumers in home renovation will bode well for the growth of the global mattress market, states a TMR analyst. Numerous home owners globally are taking efforts on enhancing their houses. This has become possible due to the increasing spending of consumers on renovation of home. On the other hand, factors such as the soaring cost of mattresses may impede the development of the market for mattresses in the coming years. This is due to the fact that the raw material of mattresses are derived from petroleum. “Nonetheless, the huge market potential in Asia Pacific will bring in new opportunities in the development of the global mattress market”, says a TMR analyst. This is due to the soaring demand for mattresses, particularly in commercial sector, in Asia Pacific.